The Fremantle ROAD2RAIL forum attracted a large number of people and the City’s meeting room was overflowing with standing room only for those who came in late. Senator Scott Ludlum, opposition transport spokesman Ken Travers, Lynn MacLaren MP, and Member for Fremantle Simone McGurk were present as were Councillors Rachel Pemberton, Andrew Sullivan and Jon Strachan. It appears to me that it basically comes down to how one stops madness, as the combined forces of the Federal and State Liberal governments do not want to invest in rail but instead want to build a truck toll road to get goods to Fremantle Port. What the proponents don’t want to talk about is that a bottleneck would be created at North Fremantle that would greatly affect local residents there and all who use Tydeman Road and Stirling Highway, Queen Victoria and Beach streets in that area. Rail appears to be the better solution, but those who propose that also say port capacity will be reached in the late 2020s, so one has to wonder if any of those billion dollars worth of investment proposals make sense for what would only be a short-term solution. Serious increase of container transport by rail can only happen if double stacking can be implemented but the present old line through Fremanle’s west end can’t support that and neither can the old rickety rail bridge. And the Public Transport Authority does not like to mix passenger and commercial train traffic on the same line. The toll road and huge six metre-high noise walls would split communities, and history in other cities and states and countries show that adding new roads does not stop traffic congestion. A second overflow container port near Kwinana has been talked about and planned but I hear there are concerns that Cockburn Sound is not deep enough for large vessels and would require constant and very expensive dredging. The forum called for grassroots action with strong local governments support, but I think the only hope to stop the Roe 8 extension toll road is that the WA State Government won’t have the money for it, so maybe praying that the iron ore price will stay down might be the best call of action. Time will tell. Sunset and sunrise are the best times to get great photos of Fremantle port, as last night and this morning proved yet again. The working port is a fantastic attraction to visitors and locals alike, but the way containers come and leave the port needs to be addressed and more containers need to be transported by rail. 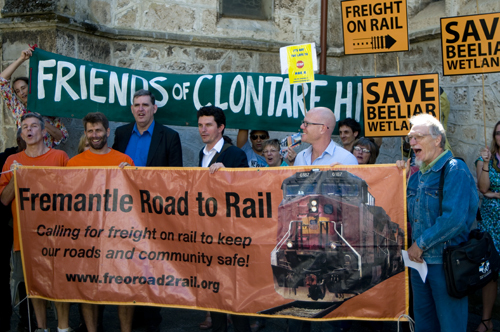 Today the Fremantle ROAD2RAIL people will hold a forum with experts at 2pm in the meeting room at the City of Fremantle. Enter from the back steps in front of MANY 6160 where they are painting a large mural.